Under construction - was stripped to studs after Hurricane Harvey & we are taking the opportunity to renovate. It will be a modern & spacious, but still family-friendly luxury 5 bedroom/4.5 bath home. Exceptional home - located on a prestigious private drive on Key Allegro Island, this special place provides a quiet comfortable retreat where you and your family and friends can relax and play. Enjoy fishing from our private pier in Aransas Bay across from your front door. Dock your boat in the canal behind the house where the kids can swim. Or hire a local guide to take you fishing in the many nearby bays or the Gulf of Mexico. Sip your morning coffee on the pier or our benches 10 feet from the edge of the bay beside our large bronze sailfish, or in the palm garden just outside the living room. Savor sunsets from the 2nd story front balcony or the large back porch. Snuggle up in front of the fireplace. Soak up the serenity from inside this well-lit and airy home with vaulted ceilings and large glass windows both front and back! Dine out at one of many outstanding nearby restaurants or cook in using the large, well-appointed kitchen with island and bars on both sides. I look forward to hearing from you. Paul Hudson was born and raised in Austin and has lived there all his life with the exception of one year in Brazil and 4 ½ years at Texas A&M University in College Station. In addition to a B.B.A. from Texas A&M in Business Computer Science, he holds a M.B.A. from the University of Texas at Austin, with specialization in real estate and finance. Immediately after graduation from UT in 1989, Paul started a consulting business, which has evolved into a commercial real estate firm now known as Hudson Properties, Inc. Paul holds a Texas Real Estate Broker license, as well as a Texas Loan Officer license. He is a member of the Austin Board of Realtors, the Central Texas Commercial Association of Realtors and the Commercial Leasing Brokers Association. Paul is very active in the community where he has served in various capacities including President (and several other leadership positions) of the Westlake Rotary Club, Chairman of the Westlake Rotary Club Foundation, and President of the Capital City Toastmasters. He is also a graduate of Leadership Austin’s Class of 2003. Paul has served in many leadership roles at First United Methodist Church of Austin, including Lay Leader, Chairman of the Board of Trustees, Chairman of the Property Committee and Co-Chair of a $3,100,000 Capital campaign. He is currently a member of St. Johns United Methodist Church, where he serves on the Board of Trustees and as member of the Companions Sunday School Class. In addition to his work, community service and church responsibilities, Paul enjoys playing the guitar, singing, songwriting, and many outdoor activities including coaching soccer and baseball, boating, fishing, snow skiing, hiking, and generally spending quality time with his wife and three children. We owned a smaller house in Rockport since 1979 and have always loved the atmosphere of the town. Key Allegro is the most vibrant community in Rockport and this house in particular is stunningly beautiful and comfortable – open and airy – it just has a wonderful feel. It was way above our price range, but once we saw it, we couldn’t live without it! Aransas Bay is at your front door! 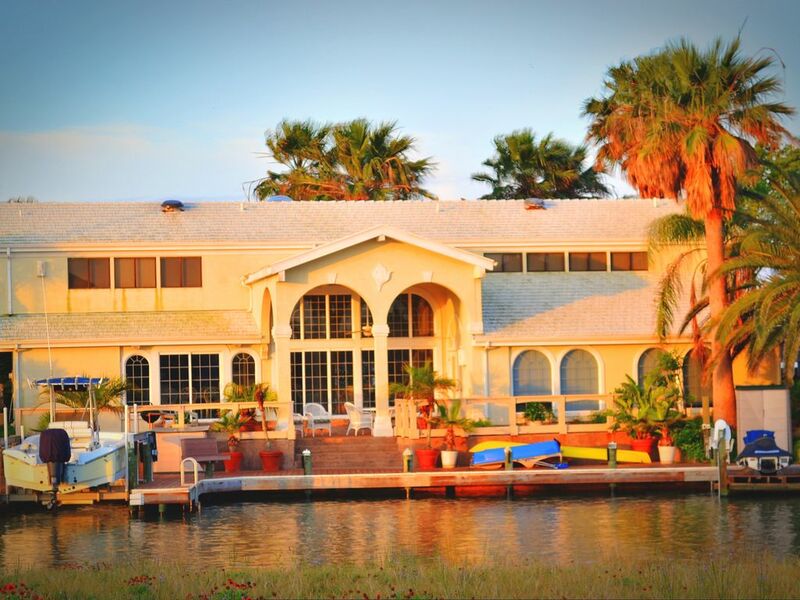 Aransas Bay is at your front door and a canal is at your back door! Game table with 4 chairs is corner of living room. Large dining room table seats 8; Atrium is adjacent & has a round table with 4 chairs. House sits right on the bay and has a canal in the back that can accommodate a fishing boat. New private fishing pier with benches in front of house. There is no landline phone; bring your cell phone & charger! Beautiful house & Great Pier! We fully enjoyed our stay this year, as we have in the past. We especially love the pier for viewing sunrises with our morning coffee and sunsets with tea or wine! Great to have you back again. I like your Keurig idea. We have resisted it, afraid that even large groups would just make a bunch of individual cups, but they are definitely nice when there are just a couple of coffee drinkers. We could solve that problem by using the re-usable Keurig cups. I'll revisit the idea. See you next year! Rockport elite property, private drive, water front, quality throughout! This is definitely one the top properties, in Rockport's top addition, "Key Allegro". Quality throughout is the best way to describe Finiserre 11, a modern ,elegant 4 bedroom dream home, the master suite is huge, with a sitting area, a temperpedic king size bed and a world class master bath area. Privacy for all 4 bedrooms and baths, plus huge family rooms for meals and relaxing. The home is great by it self, and when you add the bay front pier/view, the backdoor fishing/boating canal and the private drive, you have a vacation home that can not be beat. My grandchildren call this papa's beach house and I love it! Family memories and family tradition, this is where it happens. Thank you! We try to make the place comfortable for all ages. We are glad you had a great time & hope you come back! We found the home to be every bit as beautiful and well kept as advertised. Lots of room for a big family get together and still room to have local relatives visit for the day. Numerous activities for everyone, all ages. From swimming and kayaking in the canal, to fishing and kite flying off the private fishing dock. Game tables for board games (a closet full on site), a large kitchen and bar-b-q out back. Definitely the best stocked rental we've ever had including Port Aransas, Telluride, South Padre, Cozumel and so on. We definitely hope to come back!! Thank you! We do try to stock the place for a family gathering of all ages. We are so glad you enjoyed your stay & would welcome you back! Beautiful and ideal home for family vacation! Everything about this wonderful home was exactly what was needed for our carefree family get-together. Even the pictures (as enticing as they are) cannot do it justice. We would have no reservations in recommending this property for that purpose. We would certainly put this at the top of our list in the future. We are so glad your family enjoyed your stay! We would love to have y'all back! Everything about the home was ideal for our group. Beautiful views, stunning sunsets, fun fishing off the piers, abundant kitchen supplies for delicious meals, blissful kayaking, waterfront walks and comfortable furnishings. Great memories were created and we'd definitely come back again. Thanks! I'm so glad the place worked well for your group! We look forward to your return! We LOVED the view of the water in the front, and being on the canal in the back. The home was beautiful as well. If I could make a suggestion, it would be that it needs TV's in all bedrooms. There was a flat screen in the bedroom with the bunk beds, and an old TV in the master (with dead batteries in the remote) but the other 3 bedrooms had no TV's. The master bathroom also did not have any washcloths in it, but that was probably just an oversight on housekeeping's part. Otherwise, our stay was just perfect and I highly recommend this house and location! Thanks for the review. We have resisted putting TV's in all the bedrooms because when we are there, we are always out and about enjoying all that Rockport has to offer. But we will be replacing that old TV in the master bedroom with a new flat screen soon. I always hate throwing away things that work perfectly well, but I think it's time for that one! Sorry about the dead batteries in the remote and the oversight on the washcloths in the master bathroom. I will mention that to the housekeepers. We appreciate the feedback. Hope you'll join us again and give us a chance to earn a 5-star review. Fish on our private pier in our front yard, or at night over our submerged 'green ball' fishing light in the canal behind the house. The kids will love the calm beach and playscapes at the nearby Rockport beach park. While watching for dolphins, ride the ferry to Port Aransas and enjoy the expansive ocean beach and surf of the Gulf of Mexico. Or just relax down the street by the Key Allegro Island swimming pool and grab a bite at the marina restaurant. You are only 30 minutes from the State Aquarium and the USS Lexington aircraft carrier museum in Corpus Christi. Take a Whooping Crane tour at nearby Aransas Wildlife Refuge. Tour the historic Fulton Mansion just a few blocks away.